We are a leading Manufacturer of crushers and grinders from Delhi, India. A crusher is a machine designed to reduce large rocks into smaller rocks, gravel , or rock dust. 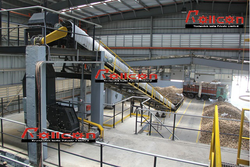 Crushers may be used to reduce the size, or change the form, of waste materials so they can be more easily disposed of or recycled , or to reduce the size of a solid mix of raw materials (as in rock ore), so that pieces of different composition can be differentiated. Crushers are devices that are designed to decrease the size of larger objects by using force to reducing the objects into a smaller and more compact volume. This is sometimes accomplished by compacting the mass of the object. At other times, the crusher will be used force to break the object into a series of smaller pieces. Crushing is helpful in a variety of applications. Around the house, a small manual crusher is often used to reduce the size of aluminIum cans. This action makes it possible to store the crushed cans until a sufficient quantity is collected to transport to a recycling facility. Manual crushers of this type are often very inexpensive, and take up no more room than a standard countertop kitchen appliance. IMPACTOR – Impactor is a type of crusher where some impaction is being used for crushing of rocks. In normal types of crusher pressure is generated for the crushing of rocks. But, impact crushers involve an impact method. Impact crusher has a blow bar that has very high chrome. Impact crusher makes a very simple flow chart of crushing material. Impact crusher has an ability to crush hard rocks. HAMMER MILL - Hammer crusher is used for crushing medium hard materials with weak abrasiveness, and the compression strength of the materials to be crushed should not exceed 100MPa, and the water content should be lower than 15%. The materials of hammer crusher are coal, salt, chalk, gypsum, tile and limestone and also fiber structure and broken wood and paper with strong elasticity and tenacity. JAW CRUSHER - Jaw crusher is mainly used for the medium-granularity crushing of all kinds of ores and large materials in mine, metallurgy, building material, highway, railway, water conservancy and chemistry. The maximum compression strength of the materials to be crushed is 320MPa. BALL MILL - A ball mill is a type of grinder used to grind and blend materials for use in mineral dressing processes, paints, pyrotechnics, ceramics and selective laser sintering. The ball mill is used for grinding materials such as coal, pigments, and felspar for pottery. Grinding can be carried out either wet or dry but the former is performed at low speed. Blending of explosives is an example of an application for rubber balls. SHREDDER- The Ideal shredder for industrial usage, dump all your waste in this machine and watch it get destroyed easily and effortlessly. It will be a safe and sure way to avoid all your factory waste from getting misused. Looking for Crushers And Grinders ?